This kit is only use for circuit. D2 have many experiences of setting up the coilover kit for circuit. We won the championship more than 250 times and install D2 products to estimate. 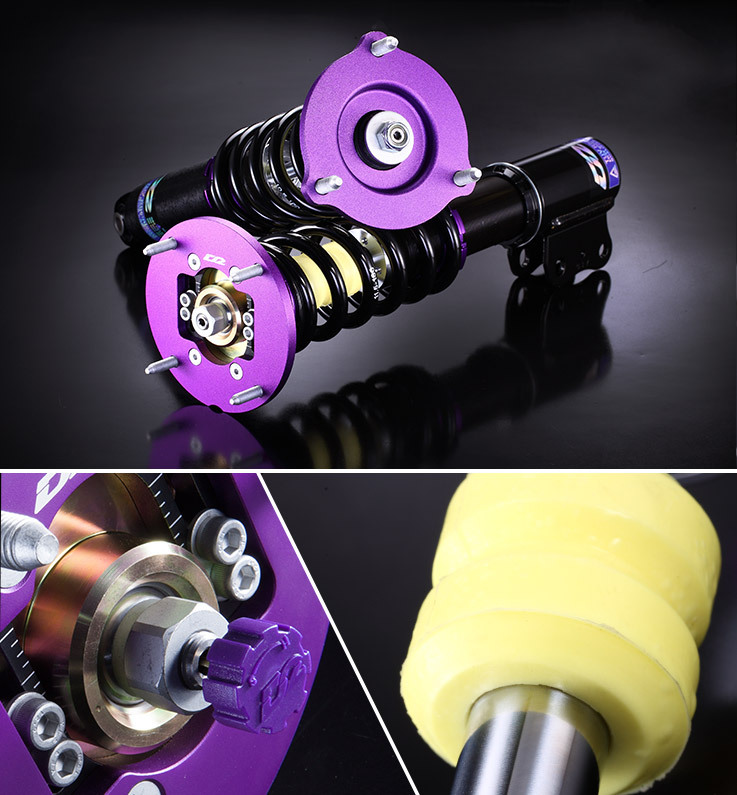 In order to make each and every vehicle experience the best performance, you shall offer us the details of all parts for your car and purpose, so we can customize the coilover kit only for your car. Aluminium upper mount for wishbone coilover is able to enhance the handling and pillowball upper mount for McPherson coilover is able to enhance the handling and adjust the camber angle. 36 different damping settings are able to response the varieties of road conditions. Aluminium lightweight ride height adjustment adjusts the ride height desired and reduce the weight of vehicle. The spring rate and damping force are specially made for circuit. Standard monotube designs with φ44mm big piston and don't rise the oil temperature easily to maintain the performance of coilovers. The ride height can be dropped 60~120mm from OE ride height for your reference. Camber and caster can be adjusted by 3D pillowball upper mount which is for your option. The "model year" defined for each application on our website might be different to the ones in each country; therefore, please confirm the "production years" with us if you cannot make sure. Circuit suspension kit is made specifically for your personal use so both front and rear struts are marked as "★"